Traditionally, most workers used to rely on income from their monthly retirement contributions such as Personal retirement savings and social security plans. Today, most employers are doing away with pension plans and replacing them with workplace retirement savings packages such as the 401a and the 401k. Both the 401a and the 401k are regarded as sponsored retirement savings plans for the workplace, perhaps they are regarded as “tax codes”. Using the one or the other will largely depend on the type of employer offering them, and the circumstances surrounding the arrangement with the workers. 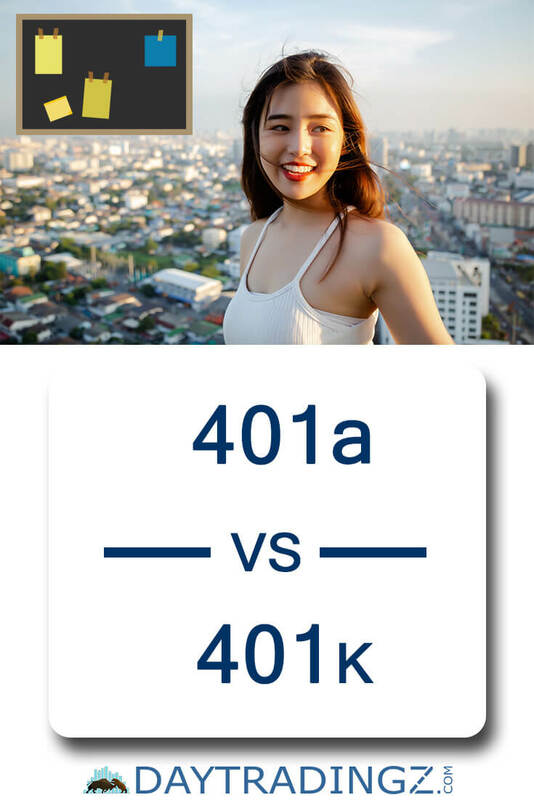 401a vs 401k: In this article we reveal the main differences of both retirement savings plans. What exactly is the 401a retirement savings plan? What Exactly is the 401k Retirement Plan? 401a can be referred to as a money-purchased retirement package largely offered by NGOs, government establishments and educational institutions. The 401a is customized and offered to certain employees as an incentive to keep them loyal to the organization. Though it is an incentive, the monthly contribution to this plan is usually dictated by the employer. While the employee contributes mostly to the 401a, the employer also makes additional contributions to the plan. The employer of the beneficiary of the 401a will normally schedule the contribution into the 401a, and will also schedule the remittances of such contributions, which means, it may not be monthly but a quarterly, bi-annual or annual contribution. If the employee leaves, he or she can easily withdraw the contributions by rolling the contributions over to a qualified retirement savings plan or buy an annuity with it. One of the main features of the 401a is that it can be contributed after or before taxes are deducted. In emergency cases, or some distributable events, an employee can withdraw part of this investment fund and the amount withdrawn will be subjected to income taxes. Yes, there are penalties for early withdrawal from your 401a retirement plan. There is a penalty for withdrawing from your 401a before you attain the age of 60. In most cases, 59 ½ is the age limit at which you are advised to withdraw. The 401k savings retirement plan is mostly offered by private sector employers. The eligible employees who qualify for the 401a can decide to contribute voluntarily. The employers normally have options when contributing to this retirement plan. The employer can match a certain percentage of the employee’s contributions if the employee does not have the financial strength to contribute fully. Unlike the 401a that can be contributed before or after tax, the 401k is pre-taxed before the contributions are made. One of the main benefits of the 401k is that an employee can change the amount he or she contributes at any point- this benefit is not available in the 401a. Secondly, contributions to 401k come with some tax advantages. For instance, an employee can defer a portion of his or her wages into the 401k plan just before taxes are applied. Employees, for this reason, can determine the volume of their pre-tax contributions, in order to save money in the long run. If you do not withdraw from your 401k until after retirement, then such withdraws are completely tax-free. Unlike the 401a where the employer and employee make contributions, only the employee makes contributions monthly into the 401k from their paycheck. Though the employer may offer an alternative plan it is not mandatory for the employer to contribute into the 401k. The employer can also decide which investment options are available to the employee and in most cases, there may be up to 30 investment options available. Providing too many 401k investment options to employees have been found to be quite complex and confusing. One of the main disadvantages of the 401k is that they are taxed each time the owner withdraws funds. 401a is a retirement plan that is offered by public employers and NGOs, the 401k is a retirement plan offered by private employers. Participating in a 401k is not compulsory but it is mandatory to partake in 401a. The 401k allows an employee to dictate how much he or she wants to contribute out of their paycheck, the 401a is always set by the employer. The 401k normally offers an employee the chance to choose from a wide range of investment options, the 401a on the other gives more power to the employer as regards the available investment options they can offer their employees. The limited investment options in 401a can help reduce the risks of investing in certain products. 401a and 401k also differ in terms of eligibility. According to the section 410a (1) Act of the IRC (Internal Revenue Code), to be eligible for a 401 a or 401k, the employee must be at least 21 years old or must have completed a certain level of the company’s sponsoring the retirement plan. The minimum length of tenure that the employee must have completed qualifying for a 401a is 2 years and the minimum for the 401k is 1 year. Are There Minimum and Maximum Contributions in 401a and 401k? Another major difference between the 401a and the 401k is that an employee can contribute a maximum of $18,500 annually to the 401a, while a maximum of $55,000 annual contributions is allowed in the 401a. For this reason, the volume of investment in the 401a is quite higher than 401k, and that also means a 401a beneficiary may have more disposable funds after retirement than an individual who started the 401k contribution at the same time. The 401a has its own tax advantages too. Employees who contribute voluntarily to their 401a, 401k and several other retirements plans that qualify for IRS incentives attracts some tax credits. Your qualify for tax credits as long as you are older than 18 and you are not a full-time student. Under the 401a tax credit, you will get tax credits if no one claimed that you are dependent on them. The number of tax credits you qualify for could be 10%, 20% or 50% of your entire contributions toward your retirement plan, which can be up to $2000. There is a major difference in the number of contributions between 401a and 401k. According to the International City/County Management, employees who operate 401a may also contribute to the 403 and 457 plans at the same time- this offer is not available for individuals who operate the 401k. While the maximum annual contribution to the 401k is $18,500, employees older than 50 years of age are allowed to contribute an additional $ 6000, up to a total of $24,500 per annum. An employee operating the 401K is also permitted to operate the Roth IRA, where there are some limits to the maximum you can contribute. You can incur a 6% increase in taxes for each year your money stays in the account when you contribute too much to your IRA. Perhaps, this could be one of the reasons why many 401k employees prefer to stick with just the 401k and ignore the Roth IRA. When it comes to minimizing risk, financial experts believe that the 401a generally comes with lower risks of investments than the 401k. 401a operators limit the number of available investments to employees and these are usually the safest and most secure investments. On the other hand, 401k employees are presented with more investment opportunities that attract higher risks, hence the modest returns on investment in 401a are much lower than returns on 401k investments. If you don’t like taking too many risks, the 401a will be a better option with modest returns. This does not mean that the 401k does not offer you the chance of investing in low-risk options such as annuities, equity funds, and municipal bonds. It is possible to borrow from either type of retirement plans, there are however certain restrictions that apply. In 401a, some employers may allow you to borrow up to $5000, and some may not allow you to borrow at all. Legally, you are not allowed to borrow more than half of your total contributions in the 401a. If you borrow from your 401a before the age of 59 ½, you may have to pay up to 10% interest as penalty fee. This rules also apply in 401k, as a matter of fact, you may be taxed when refunding money borrowed and you are not allowed to borrow more than half of your contributions. Regardless of whether you choose the 401a or 401k, the secret to maximizing your income through this plan will depend on a number of factors. It pays to resist the temptation of withdrawing your funds at any point in time, and before your retirement. The funds accrued on your 401a or 401k retirement for several years can secure your future financially, especially after retirement. You need to develop a plan, in addition to analyzing the differences between the 401a and the 401k. You should determine your financial goals and with the help of a retirement calculator, you can work out how much you want to save over a period of time. ​Bernz JP is the blogger behind Moneylogue.com. BA in Accountancy, he entered the entrepreneurial world by starting his first online marketing business in 2004. Passionate about personal finance, the stock market, and a digital marketing addict. An avid golfer and currently a 15 handicapper.